It's cold out there, guys. So cold that lakes are so frozen that they look like they're from the Moon. So cold that freaking grounds explode. But now that it's a little less cold, the ice is melting from our frigid Earth and forming giant ice balls in our lakes. 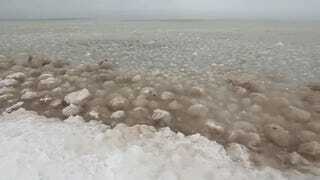 Here is the balls on Lake Michigan, the way they move with the current makes it look like alien eggs are hatching. Gross.